In retrospect we shouldn’t even have had over-the-air HD because those who cared enough about TV to appreciate HD already had cable or satellite and, as you said, the spectrum is much more valuable for other uses. 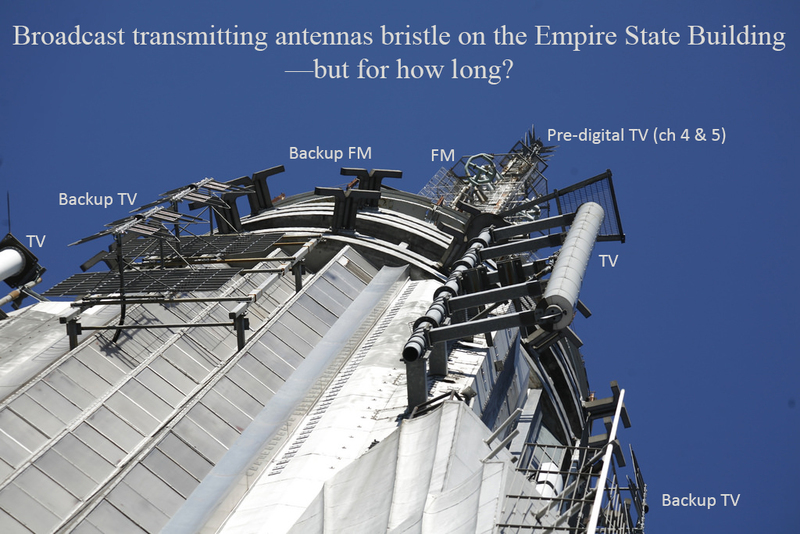 ATSC is probably useful as an industry standard… as long as you don’t broadcast it over the air. 1080i is also an interesting story, since it was more or less designed for CRT HDTVs… which basically never came to market. This is what we got for finalizing a standard in ~1997 for equipment that didn’t become affordable until ~2006. Imagine setting a standard today for equipment of 2025! IIRC in Germany they packed multiple digital SD stations into each 6 MHz channel, freeing up tons of spectrum. Thanks Wes. Well put. And some helpful history and facts in there as well. One argument I’ve heard for keeping over the air TV and radio is the need to serve rural areas. Yet we have satellite radio (albeit a monopoly of one company with no competitors) and TV (with just two competitors, but that beats having only one). We might lose the charm of a WNAX a KFYR, a WBAP, each of which cover (see those links) enormous stretches of the biggest flat states in the country (the first two with just 5000 watts each—only 1/10 the maximum allowed). But the best those stations have to offer is also available by data over cell systems, podcasts and other workarounds. My mother and her immigrant Swedish family grew up in Napoleon, North Dakota (motto: “It’s not the end of the world, but you can see it from there”), listening to WNAX and KFYR by day and the big “clear channel” stations from Chicago (WMAQ, WGN, WLS, WBBM) at night when AM signals bounce off the sky. Those were their connections to the bigger and biggest outside worlds, far beyond the driving range of their Ford Model A. In North Carolina, where I lived for most of the stretch between ’65 and ’85, the giants were on FM, radiating 100,000 watts from towers up to 2000 feet tall. By the end of that time, those stations dominated the ratings. Still do. But listening is now dominated by streaming services such as Spotify and Pandora, plus SiriusXM “stations” for dozens of musical tastes long since abandoned by terrestrial radio, with a fraction of the advertising, or none at all. So we’re in the Napoleon, ND of broadcasting now. It’s not the end of that world, but you can see it from here. Bonus link: a coverage map for CBK in Regina, Saskatchewan: the biggest in all of North America. That’s what 50,000 watts at the bottom end of the AM dial (540) on the most conductive ground on Earth will do for ya. CBC has been dumping its AM stations, but I do hope they keep this one.